We’d love your help. Let us know what’s wrong with this preview of Storm by Tara Shuler. With two guys in love with her, and her feelings torn between them, Alice thinks her life couldn’t be more complex. Then she meets two mysterious cloaked strangers – brothers Alexi and Liam. Alexi knows more about Alice than anyone, and he could be her most challenging adversary. Or will Liam turn out to be enemy number one? She will find out sooner than she thinks that the With two guys in love with her, and her feelings torn between them, Alice thinks her life couldn’t be more complex. Then she meets two mysterious cloaked strangers – brothers Alexi and Liam. Alexi knows more about Alice than anyone, and he could be her most challenging adversary. Or will Liam turn out to be enemy number one? She will find out sooner than she thinks that there is a real villain lurking in the shadows – waiting for the right moment to strike. I didn’t like this book as much as the first; it was less funny, and more eye-roll-inducing. Alice continued to be a bit irritating in this book, and boy was she horny! Even two boys weren’t enough for her in this book! She had to add a third to the mix! How many boys can you swap spit with (and more), and proclaim you love, all in only 215 pages? I mean really? What a tease! The storyline in this started to irritate me a bit. Everybody loves Alice, Alice is the centre of the known universe, and everybody would happily die to protect her. Does anybody say ‘you know what? You can’t make a choice, you have 2 other blokes on the go, I’m going elsewhere’? Nope, they all just try to outdo each other in the kissing championships, and wait their turn. The only one who ever complains is Kai, and he is such a whiny little brat! The ending to this was yet another cliff-hanger. Not sure I can be bothered to go straight into the third book though. It's defiantly a possibility for Alice. Two guys wasn't enough for her in this book, so she got a third. By the end of book four she'll probably have enough guys to name after days of the week! The storyline in the last book was alright, and there was loads of parts that made me laugh (Even if they weren't intended too.) but in this one, it was dull. Everything that happened, i didn't care about. Alice annoyed me, Her love interests annoyed me more (Kai, especially.) and i was just bored. Overall, Dull and had an annoying Love square. Seriously 3 guys?And shes loves all them?I did read books with more love interests but this was errr....i mnt sure...could be better? I don't know WHAT it is about the BLOOD HAZE series, but I just can't stop reading it! In the first book of this series, we met an .. interesting ... assortment of characters. There was Alice, our kind-hearted vampire heroine who was slowly learning she has stronger powers than she ever knew she posessed. Then, there was Kai, her overly-moody, clingy, melodramatic vampire boyfriend, who tended to never leave her side (and actually moved into her parents' house -- creepy!). Soon enough she also me I don't know WHAT it is about the BLOOD HAZE series, but I just can't stop reading it! In the first book of this series, we met an .. interesting ... assortment of characters. There was Alice, our kind-hearted vampire heroine who was slowly learning she has stronger powers than she ever knew she posessed. Then, there was Kai, her overly-moody, clingy, melodramatic vampire boyfriend, who tended to never leave her side (and actually moved into her parents' house -- creepy!). Soon enough she also met Max, a vampire hunter turned romantic-possibility who always lingered right outside Kai's bubble, but never quite close enough to become number 1 in Alice's heart. Obviously with Max being a well-connected hunter, and Alice and Kai being pretty obvious vampires, there were a lot of trials and tribulations for our little trio in book 1. I think the only problem I have with this series, for real, is the fact that the male characters are all a bunch of losers, honestly. I mean, none of these guys seem to have any identity apart from swooning over Alice (who none of them have really known, in person, for more than a very short period of time). Are we readers *really* supposed to believe that not only would these three guys give up their entire lives for Alice but that her new female friend from school, Liam, and this whole weird vampire organization would all be at her beck and call, even to the point of dying a gruesome death for her? Sorry, folks, this reader just doesn't buy it. And, Alice, for crying out loud, let's go ahead and ditch Kai before he possessively chops you up in pieces, in some clingy act of passion, and gets you your own Lifetime movie memoir special, please! Of all these men, Kai is your choice? Really? This was a really good story. I love, love, love the character Alexi. At first I definitely thought he was a bad guy, demented, and really old (because of his hair color). He turned out to be pretty awesome and the perfect guy. Kai was really annoying with his jealousy and possesiveness but he was still one of my favorite characters. Max was mostly in the background, which I kind of liked because there wasn't too many characters to keep track of, which can be a pain. Overall the book was great an This was a really good story. I love, love, love the character Alexi. At first I definitely thought he was a bad guy, demented, and really old (because of his hair color). He turned out to be pretty awesome and the perfect guy. This would have been a great series had the author completed her writing. She however never completed the final book for that she announced would be out in late 2011. I don't advise starting a series that the author has made impossible to complete. This novel was like 150% better than the first installment in the Blood Haze series. I was impress how well it was written after the first one being kind of a mess. The author definitely did a lot better or got a better editor. This was just as exciting as the first. Alice is a wonderful person she cares deeply for all who are close to her. But who will she end up with? Three men in love with one girl. Wow! As I am new to good reads & am just now adding my books I will not be giving detailed reviews at this point. Hopefully I will have time to edit & give reviews later. I liked this book just as much as book one. Alice sure is one popular vampire with the guys, they are growing in number lol. This series is SO far out there that none of it makes any sense, but I just cant stop reading it! 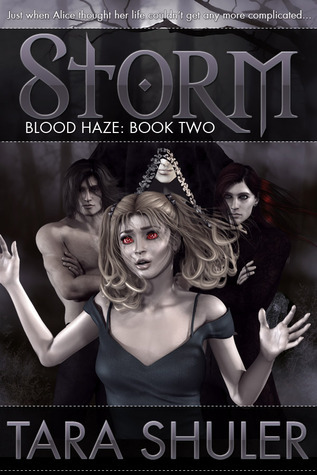 I am the author of the Blood Haze series of YA paranormal romance books. I also have several adult series in the works, including an adult vampire series, and a science fiction series.